← St. Ignatius Loyola Is Twee? Whee! 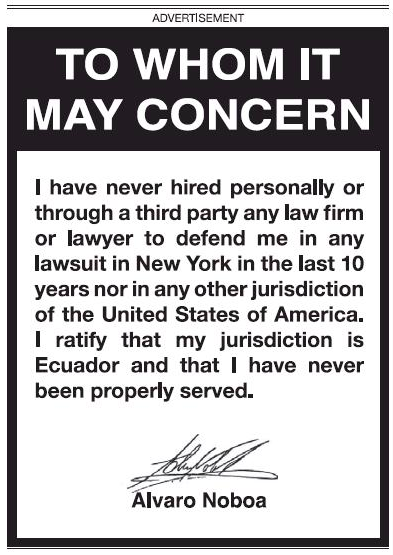 As the hardworking staff recently noted, some guy named Alvaro Noboa is involved in some kind of legal rumpus that has led him to run some lawyered-up ads in the New York Times. Some of Noboa’s Ecuadorian companies have faced lawsuits and Servicio de Rentas Internas claims. The banana exporting company also has been audited by international organisations due to child labor issues and strike conflicts. Noboa’s major company in Ecuador, Exportadora Bananera Noboa, faced as of February 2009, an assessment of three hundred million dollars (Ecuador was dollarized in 2000) imposed by the governmental revenue service of Ecuador, the SRI. A representative of TP Consulting, an independent audit firm, stated that what is in question is the price for a crate of bananas: that which the SRI has fixed is a number above that determined by other parts of the government (the Ecuadorian banana business is regulated by the government which sets prices paid to producers for bananas, the cost of exportation and the referential FOB price.). The representatives of Bananera Noboa have stated that exportation prices were within the range of prices of exportation of other exporters, according to information from the Central Bank of Ecuador. The audit, undertaken by TP Consulting (who were contracted to carry out a study of the transfer prices of Bananera Noboa), revealed an amount to be paid of US $139,949.00. As of 2011, Bananera Noboa is still facing charges from the SRI, but the legal representatives of the Company state that the company ‘Is not Bankrupt’. A judge in New York has recommended a $6.96m default judgment against Alvaro Noboa in NYKCool’s long hunt for payment from the empire of the Ecuadorian banana baron. Apparently, there are a number of judgments against Noboa that have gone unpaid. 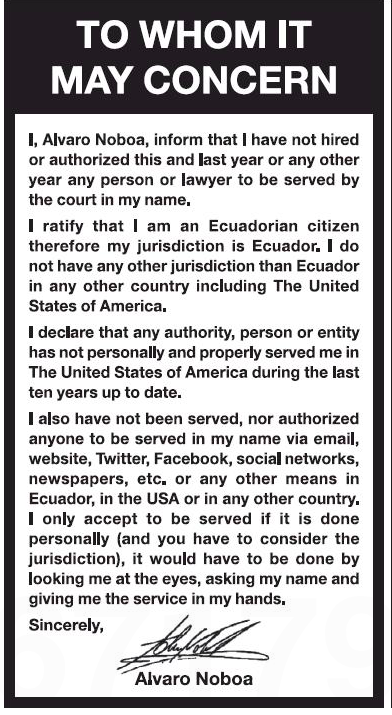 Oh, yeah – he’s also run for president of Ecuador. Four times. That’s all – for now. See you next ad. This entry was posted in Uncategorized and tagged ads run by civilians, Alvaro Noboa, CNE, Ecuador, Exportadora Bananera Noboa, Googletron, how many lawyers can fit on the head of a pen, New York Times, Whiskey Tango Foxtrot, Wikipedia. Bookmark the permalink. I told you – the whole thing is bananas. Absolutely – but rotten bananas, eh?